Meet Salto. He's a robot, designed for one specific purpose - jumping. In fact, he's the most agile vertical jumping bot that has ever been built. 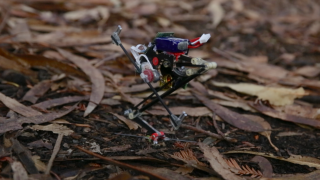 Built by roboticists at UC Berkeley, Salto was inspired by the animal kingdom's most vertically agile creature - the galago, or bush baby. The galago has the ability to leap five times in four seconds off walls and trees, gaining a combined height of 8.5 metres. How? By shifting into a special crouch that stores energy in its tendons, allowing it to reach heights that wouldn't be achievable from muscles alone. Salto does the same thing. Inside, he has a motor that drives a spring that can store energy using a similar crouch manoeuvre to the galago. Power modulation means that it doesn't need to wind up before a jump - it can immediately jump again. And jump it does. After springing into the air, it can jump again off a wall surface like a galago to reach even greater heights - up to 1.21 metres. Not bad for a bot that weighs just 100 grams and is 26 cm tall when fully extended. Eventually, its creators hope that similar bots could be used to jump around rubble in search and rescue missions. Details of the robot were published in the first edition of a new journal, Science Robotics.